Finding an apartment on Craigslist can take forever, as usually the person offering to shiatsu your armpits with hickory BBQ sauce doesn't list their address upfront. For new a site that does the dirty work for you, check out RentSavvy. 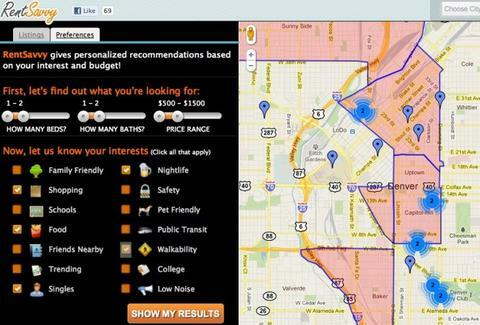 A web-gem that's useful whether you need somewhere to live, or just want to see how other apts stack up to yours, RentSavvy trawls over 6 million listings from sources like leasing agent databases, the Census, and the non-personal parts of Craigslist, then factors your preferences (price, bar/ restaurant proximity for awesome people, crime density for little girly men) into a proprietary algorithm, and returns the best places for you to live on a slick Gmap. Just enter anywhere in the state or country you'd want to live (weirdly, they also have results for Commerce City), and the site'll even pull from your Facebook to let you know how many friends you'd have living close by in each hood -- so, Hot Girl People Knew in Middle School, prepare to "accidentally" run into people on the street a lot more. The algorithm'll rank the best hoods on a 1-5 star basis in categories like Family/ Shopping/ Nightlife/ Safety/ Walkability, and zooming in will get you a closer look at photos and rental info on individual apartments, including Yelp reviews of buildings, none of which you care about, because Angela Apgar lives on East 18th Ave, and you've already made your decision. Weekly emails include new listings, and you can check their apartment hunting blog for some solid tips -- also something you can find advertised on Craigslist in no time.